I heard the peepers for the first time today--in full voice. Lore (or is it legend?) says that they have to be frozen off three times before it is officially spring, regardless of what the calendar says. 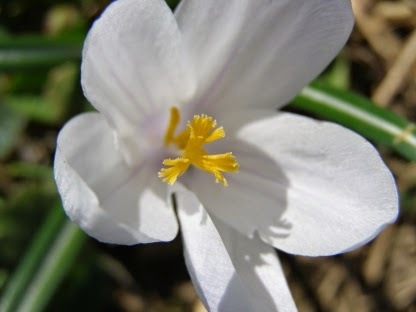 The snowdrops have been blooming and many have had crocuses. 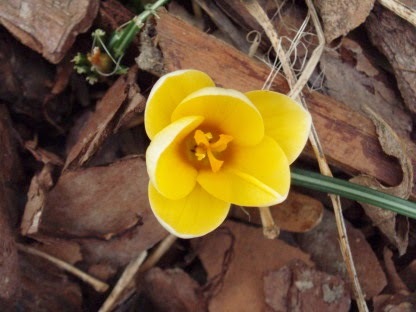 Mine are still just in the leafing out stage, but I thought I'd share a couple pics of these harbingers of spring. Finished the center of the Disappearing 4-Patch top and have just two more border sections to add. Most everyone I've talked with have stories of finishing old projects--sometimes things that only needed a border or a few blocks to move them along. What are you up to? Dickens has taken to sitting on my desk so that he can see the "action" taking place out back. 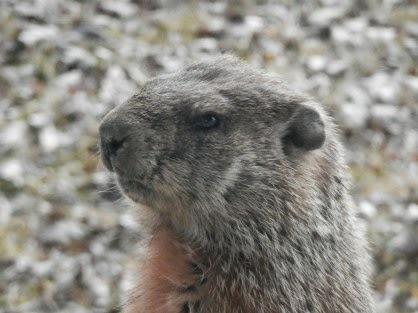 The woodchucks are out and they are not shy about sitting on the porch. And they are not afraid. 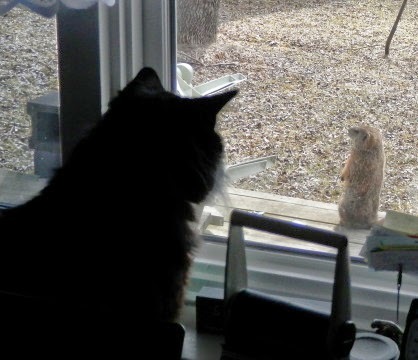 I know woodchucks are not for everyone (Diane! ), but I don't mind them. And apparently, Dickens doesn't either. Hope you are enjoying your week. I've been productive in trying to get a few things finished. How about you? Here's what I learned recently--the hard way. You know that I wash my fabric before I use it. And that has always included 5 inch squares. 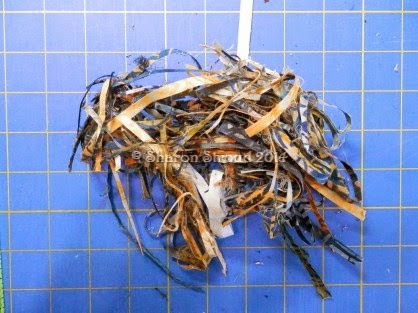 (I rarely use 2.5-inch strips and I have not found a way to wash them.) 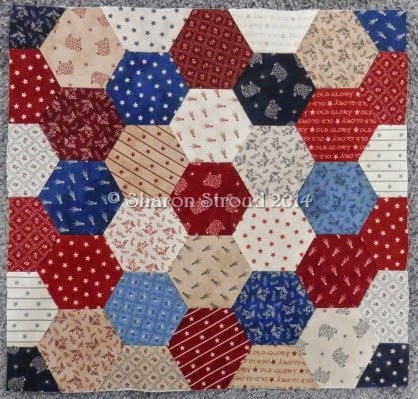 Because I have used the prewashed 5-inch squares to cut hexagons to hand piece with, I thought there were no problems. 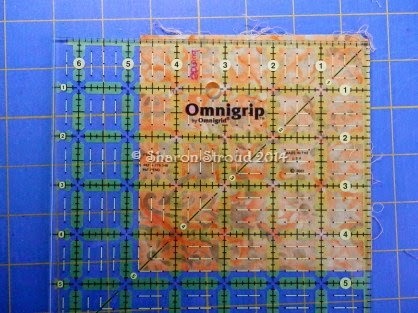 The dribs and drabs left from cutting the above hexagons. LOTS left--okay, okay, not too much left, but I had more than enough fabric in each square to do the job I wanted to. 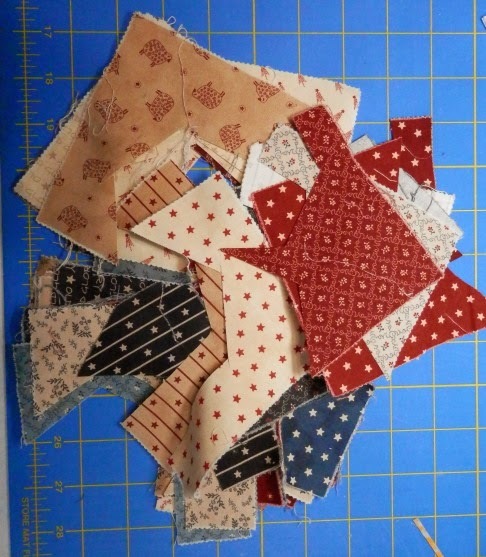 Now enter a new machine pieced project that was based on 5-inch unfinished squares. I blithely started putting the charm squares together with my perfectly cut 5-inch squares of background fabric (bought as yardage and prewashed before cutting). My first four-patch was a bit off to say the least. So I decided to measure the squares. Oops...5 inches from top to bottom, but 4.875 from side to side. 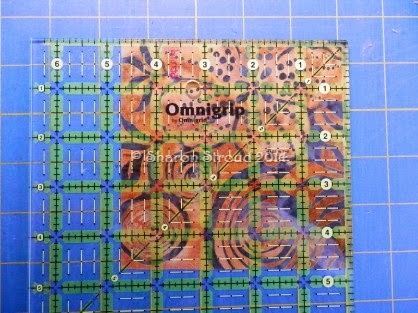 Plan B: cut each square to 4.75 inches. These had to be done individually -- all 84 of them. 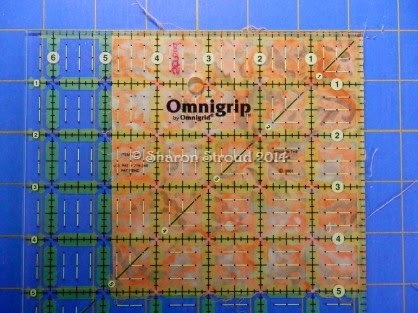 And...I had to cut down all 84 background squares, but these could be done in sets. First two sides cut, the upper right corner rotated to the lower left and the last two sides ready for trimming. Then along came the too small blocks--under 4.75 inches before any trimming! So they had to be rejected entirely. And the resulting Disappearing 4-Patch block. This is from Fons & Porter's Quilting Quickly magazine, the Winter 2013 issue. My blocks finished at 7.5-inches based on the 4.75-inch starting square. 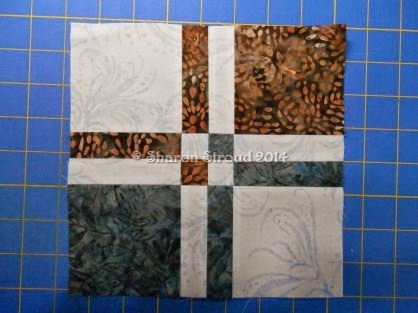 Starting with a 5-inch square should give an 8-inch finished block. The moral of this story? If using precuts don't wash anything! And then worry after the quilt is finished whether the fabrics will bleed or shrink differently resulting in puckering.... But they are so seductive--lots of variety for not much money. Now you know the whole story--choose for yourself.